As a future young adult librarian (I hope! ), I am passionate about providing teens a place they can call their own within the walls of the library. For many years, the information science field has been attempting to respond to the growing demands of these young readers. The struggle, however, remains; what place do high spirited, technologically-savvy and socially-complicated youth have in the traditionally staid library setting? As the field of young adult literature and librarianship grows, so too does the need for exciting and dynamic young adult spaces. Teens need a space that reflects their passions, energy, and culture. This space must reflect the unique concerns of their age, and recognize that teens are not large kids or young adults; they exist in between and they feel the pressures of belonging in neither camp on a daily basis. With budgetary concerns looming, however, what can the average youth services librarian hope to accomplish? Surely providing a modern and defined space requries monetary investments that many centers simply do not have, right? Well, not exactly. Of course it may be necessary to rethink major changes to structure of the space, but librarians are well versed in effective space use. Perhaps new computers and digital listening centers will be put on hold for now. However, creating a cohesive space that reflects the atmosphere of teen life need not be expensive or even dramatic. Instead, finding reasonably-priced accessory pieces that compliment the overriding feeling of the space may be the most effective use of budgets. First, librarians must make a genuine effort to work with the teen users of their centers. All of the best intentions in the world cannot make up for communication. Librarians should meet with their teen users and listen to their ideas. Of course many of those dreams may be pie in the sky, but the conversation can bring to light priorities that the information professional may not have been aware of on their own. Second, a general vision must be reached. Avoid themes as they tend to be out of date before they can be accomplished. Sure pirates are hip today, but that pirate ship look will most likely be unsavory in no time. Instead, focus on a general color scheme or feel. Modern? Comfortable? Dorm room chic? Remember to be gender friendly. That sassy pink space might attract some teens, but it is sure to put off a large portion of them as well. Focus on a few basic decisions. Bright? Primary colors? Neon? Black? Wood? White? Come to a group decision and then hit the discount stores. Trust me…. It is time to make that space pop. You’ve made a few decisions, you’ve moved a few things around to create a few different zones (think computers, solitary, and group), and now you are ready to make the most of your paltry budget. For my examples, I have focused on bright colors and a dorm room feel. Check out my finds! These modern cases from Target will make great organizers for games and equipment while providing a horizontal space for colorful accessories. Less attractive goods can be stored in an assortment of bright canvas cubes. I found the shelving unit on sale for less than $40. The cubes are featured at $6 each. 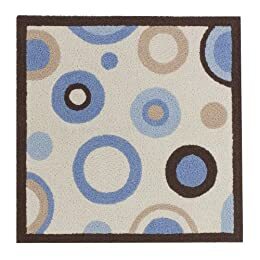 Use a bold rug to create a seating space that is inviting and fun. These selections from Target vary in size, shape, and color. Modern paper lantern lamps from World Market range in size, shape, and color. Prices vary. I also found a wide range of accessories at Walmart. Bulletin boards and photo frames in a variety of bright colors add a lot of style and impact in a variety of shapes and sizes. Prices range from $1 to $15. These fun giant clothespins add a lot of impact for a little price. These colorful cubes and trashcans add a punch of color to any space. Prices vary. Finally, these modern and bright lamps from Ollie’s add a homey feel with little financial investment. 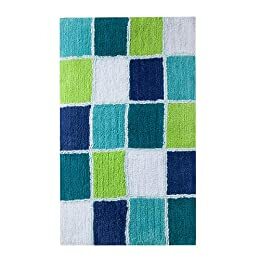 Ollie’s also carries a selection of bright and modern rugs in a variety of shapes and sizes.